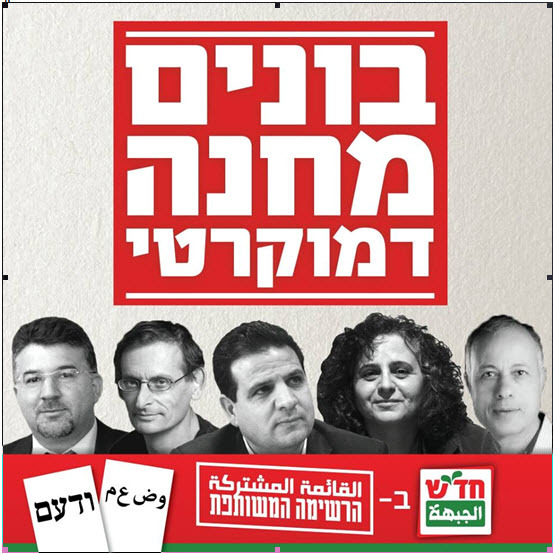 In the elections for the 20th Knesset to be held on March 17, 2015, as an expression of political responsibility and in response to calls from its respective publics, the Joint List was formed by and is running as a partnership of four political parties: Hadash (Democratic Front for Peace and Equality, Communist Party of Israel), the Islamic Movement, the NDA (National Democratic Assembly), and the AMC (Arab Movement for Change). The Joint List constitutes a resounding slap in the face to the right wing in Israel which is attempting to eliminate the voices of the Arab minority and progressive Jews in the Israeli parliament. The list is our answer to the fascist attacks and racist policies expressed in the barrage of discriminatory and anti-democratic legislation, so detrimental to the citizens of this country, the most prominent currently being a bill proposing the enshrinement of Israel as a Jewish State – the Jewish Nation State law. The Joint List is an expression of the unity of the struggle of the Arab-Palestinian public against all branches and parties of the government, and its joint efforts with Jewish progressive forces fighting against the occupation, racism, and discrimination. The Joint List is our political response to the fascist threat to exclude the Arab public from the political arena by raising the electoral threshold. Our response transforms that threat into an opportunity to close ranks and initiate a joint struggle against racism and racists, against fascism and fascists, and to remove the right wing from power and repel colonial and racist programs. The Joint List is a milestone in the history of parliamentarian political work among the Arab-Palestinian public in Israel, and a democratic framework for all progressive forces in Israel. It constitutes a force for joint collective work empowering the representative institutions of the Arab public, such as the National Committee of the Heads of Local Arab Authorities, the High Follow-Up Committee for Arab Citizens of Israel, the Arab Student committees, as well as the entire political and social world of Arab society in Israel, so desperately in need of unifying values and a patriotic partnership alongside values of pluralism, diversity, and uniqueness. The Joint List was formed with the aim of reinforcing and uniting the ranks against racism, and increasing the political weight and influence of the Arab public and all forces fighting against the occupation and racism. Each of the four parties composing the list retains its ideological identity while all partners act together in accordance with the list’s fundamental principles and the agreed upon platform. The Joint List will fight for a just peace in the region, based on the United Nations’ resolutions, and calling for: an end the occupation of all territories conquered in 1967; the dismantling of all Israeli settlements and the racist separation fence in the Occupied Palestinian Territories; the release of all political prisoners; the establishment of a sovereign, independent Palestinian state within the June 4, 1967 borders, with its capital in East Jerusalem; and finding a just solution for the problem of the Palestinian refugees which assures the right of return in accordance with to UN General Assembly Resolution 194. The Joint List will fight for full national and civic equality for the Arab-Palestinian public in Israel as a native minority with collective and individual rights. The list will demand recognition of the Arab public as a national minority with the right to self-administration in the fields of culture, education, and religion, as part of the Arab-Palestinian people and the Arab nation.The Joint List will act to assure full equality in all walks of life, and will struggle against the regime of racist discrimination and national oppression, in order to achieve equal opportunity, material equality, and corrective and distributive justice. The list will fight against the confiscation of lands and the demolition of homes and for the recognition of all unrecognized villages, in order to provide land for homes, for industrial areas, and for places of employment. The list will battle for recognition of the rights of displaced persons, including their right to return to their villages and lands; will fight to annul compulsory military service for the Arab-Druze community, and against all programs of military recruitment and national service for young Arab people; will act to impart the values of pluralism and tolerance, and will grapple with the afflictions of violence, crime, and the anarchy currently rampant in the possession of weapons. The Joint List will fight against all manifestations of racism and fascism, and for the democratic rights of all citizens. The list will fight to annul the Defence (Emergency) Regulations and all legislation which violates rights and restricts liberties, and for the writing and implementation of a democratic constitution for Israel based on the values of equality, justice, and human rights, as well as basic social rights and democratic liberties. The Joint List will struggle for workers’ rights and social and environmental justice, and will fight for the interests of the weaker classes in our society against governmental policies which make the poor even poorer, and the rich richer. The list will battle against poverty and unemployment in general, but particularly within Arab society, and for raising the minimum wage to at least 60% of the average wage in the marketplace, and for the assurance of the basic rights of health, education, welfare, and residence for all citizens. The Joint List will fight for equal rights for women in all areas of life, and against all forms of oppression, exploitation, discrimination, and violence against women in the family, at work and throughout society, in particular the murder of women. The list will struggle to assure the rights of women to education and employment, as well as political, social, and cultural involvement. The Joint List will battle for public support and empowerment of culture and art with no discrimination or exclusion. The list will fight to preserve the status of Arabic as an official language, and for such status to be given expression in all areas of life. The list will struggle for the right to develop Arab culture freely and independently, to enhance national belonging and identity, and to impart a culture of democratic dialog. The Joint List rejects imperialist intervention in the affairs of the countries of the region and the world, the policy of “divide and rule,” and ethnic, religious, and community sectarianism, and the dissolution of countries and peoples. The list supports the rights of nations to independence, freedom, justice, and democracy. The Joint List will fight for nuclear disarmament in the Middle East, including Israel, and the prohibition of all weapons of mass destruction, as part of an effort to create a world free from nuclear weapons. Against the Occupation and For a Just Peace in the Region! National and Civic Equality for the Arab-Palestinian Minority! Against Racism and Fascism, and for Democratic Rights of All! Workers’ Rights and Social and Environmental Justice for All! Equal Rights for Women in All Areas of Life! Empowerment of Culture, Language, Belonging, and Identity! Against Imperialism and Sectarianism, and For the Rights of Nations! For the Disarmament of the Middle East from Weapons of Mass Destruction!